I wanted to post another piece of art from my mystery novella The Pale Rose, and thought I would include the character descriptions featured at the start of the book. 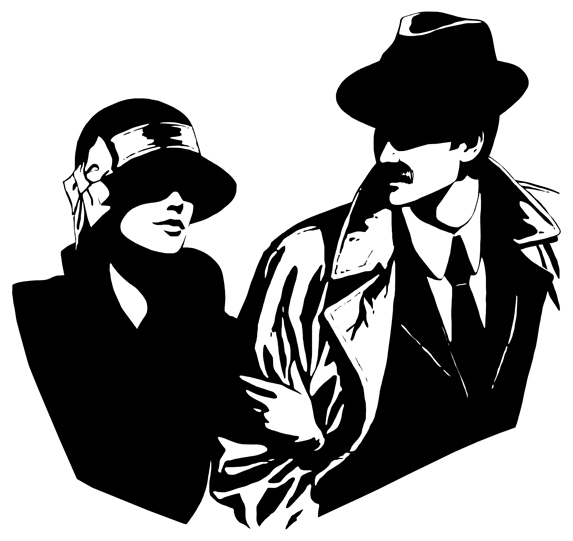 Incidentally, this illustration is for the last chapter, and features the lead detectives, Charles & Amelia Humble. Amelia Humble: A devoted wife and mother with a scandalous proficiency for probing the criminal psyche; though no one would know it to look at her. Charles E. Humble: He would have gladly admitted to his wife’s marked hand in shaping his career, had she not forbidden him from doing any such thing. Montgomery Townsend: Unwavering in his devotion to the woman he loves; hiring a private detective was only the first step in his endeavor to find his wife. Josephine Townsend: An effervescent woman with expensive taste and a love for things of beauty. Gregory Richards: A close friend of Mr. Townsend, he appeared to care little for much of anything, least of all his tiresome wife. Victoria Richards: A woman very practiced at forgetting unpleasant things, and speaking only of pleasant ones. Rufus Barrymore: Born to money, he had little need to think, which was fortunate for him, as he had little ability to do so with any degree of success. Oscar Barrymore: Life’s wicked jokes had hindered any grand plans for his future, souring both his perspective and mood. Patricia Bartlett: A dear friend of the missing woman, her appearance was as agreeable as her manner was helpful. Mrs. Attwood: She was unable to attend the party on the evening of the tragedy, though this hardly meant she could add nothing to the investigation. Forbes: He maintained an appearance of rigid strictness, but inwardly seemed to hide something more. Matilda Oliver: A young maid who kept to her work, and tried her best to stay out of trouble; though trouble had a way of finding her. Miss Kippering: The highly suspicious cook, her unpleasant nature made it no wonder at all that she never married. Vincent Welling: Mr. Townsend’s bungling assistant, who still held his employment to the great marvel of all who met him. Inspector Cole: The inspector in charge of the case, his disproportionate arrogance seemed to be the beginning and end of his character. I love the novella. I love the premise of the main characters – the cute couple, and sincerely look forward to more stories in the series. I love your black and white art. I’ve always loved this style of light and shadow high contrast art. I love Agatha Christie cozy mysteries, and the 40s and 50s are great fun to ‘get in to’. Anything near London is FAB too!! BRAVO!!! Thank you. I agree with everything you said. Love that style of art, love Agatha Christie, and the 40s and 50s. I quite like the characters as well and fully intend to write more with them, simply because I enjoy writing their banter so much, and also, I have numerous other mystery ideas in the works.